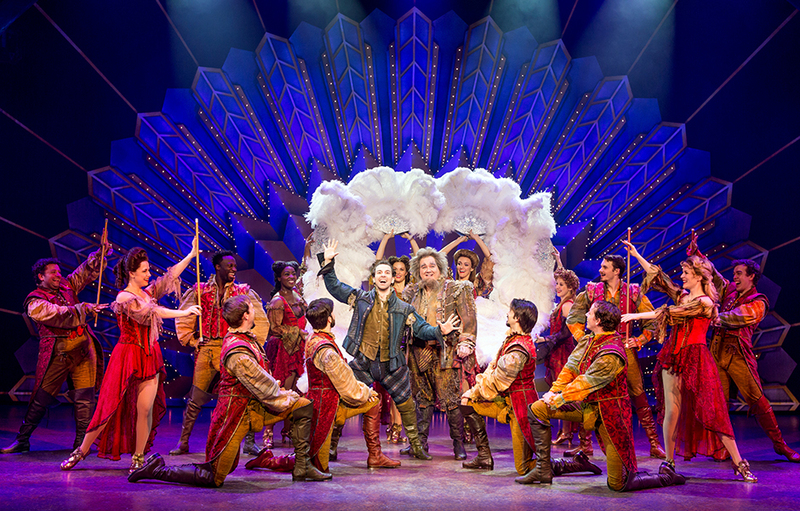 Night after night, the fifth number in the hit show “Something Rotten!” earns an early standing ovation. It’s called “A Musical,” sung by unreliable soothsayer Thomas Nostradamus as he explains to baffled Elizabethan-era writer Nick Bottom what the next big thing in theater will be: musicals. Director-choreographer Casey Nicholaw and music arranger Glen Kelly fashioned the song into a literal showstopper with a cascade of references to famous musicals, characters and choreographers. HOW MANY MUSICALS YOU CAN COUNT WITHIN THIS MUSICAL? WATCH A PREVIEW OF THE NUMBER BELOW. “Glen and Casey sat and talked through the number, then as Casey’s imagination got going, he’d say something like, ‘And then we go into a section that feels like ‘Big Spender,’ and Glen sits at the piano and figures out a way to weave that bit of melody into the dance arrangement. However, the creators point out knowing a lot about Broadway isn’t integral to the audience’s enjoyment. This entry was posted in Broadway Series, Family-Friendly Shows, Features, Upcoming Shows. Bookmark the permalink.